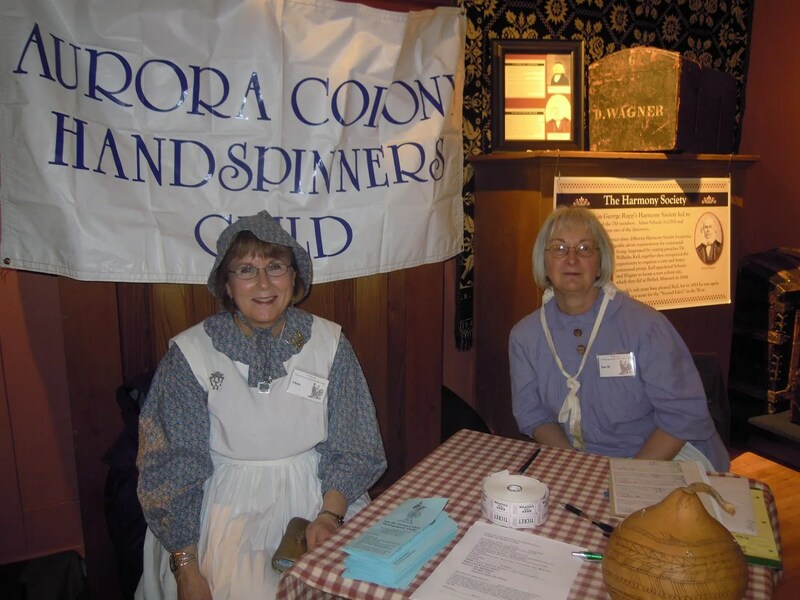 These two lovely ladies were at the table where the raffle tickets for the wheel I was spinning on were being sold. Six foa five dollah! Some people bought $20.00 worth of tickets. One wahine told me that it only takes one ticket, so that’s all she bought. 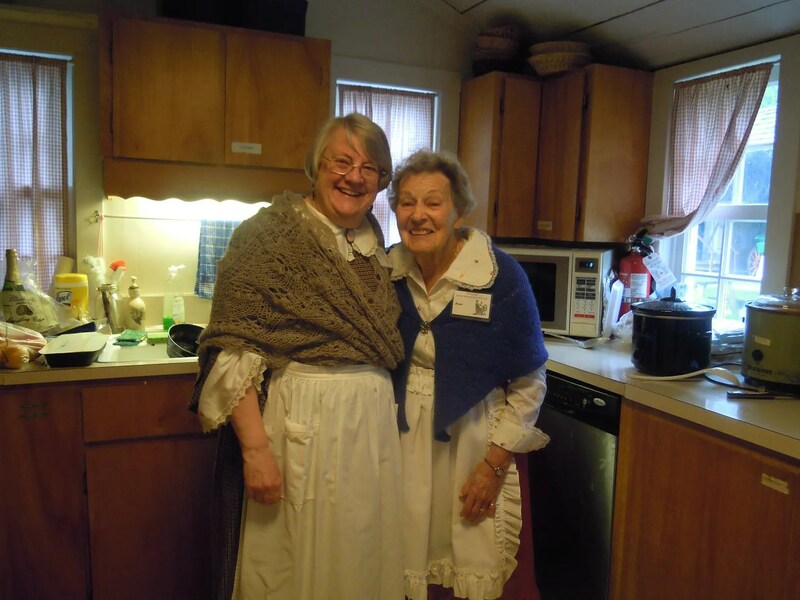 We couldn’t have managed without these two ladies; they managed all the food and cleanup in the museum’s kitchen. 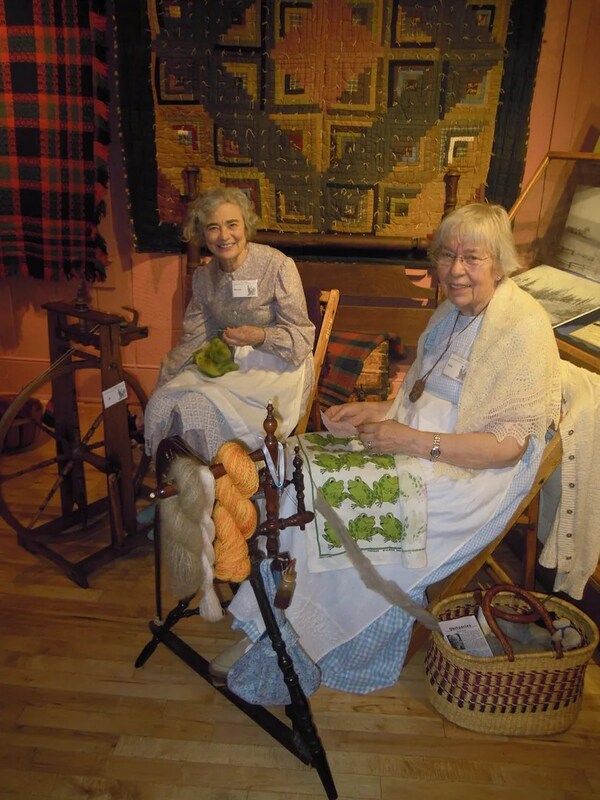 Jean, on the right, is amazing; in her nineties, and a real contributor to our guild. 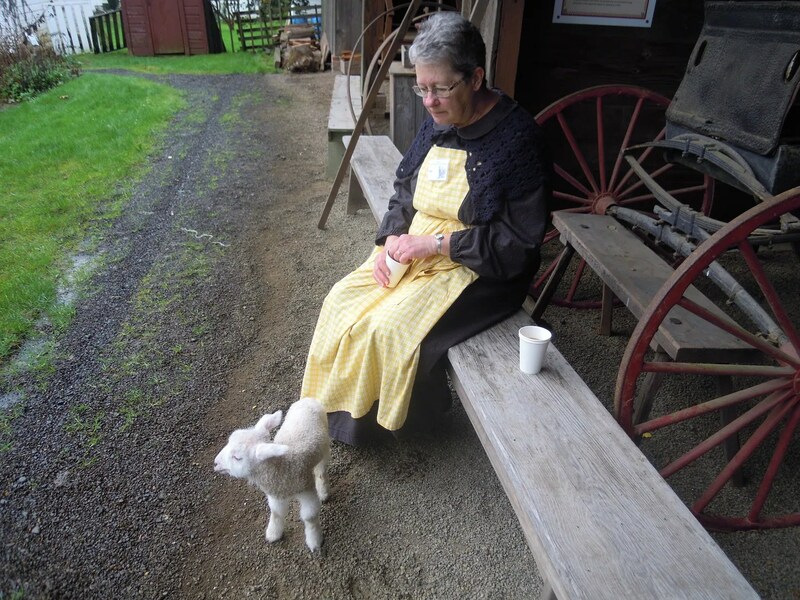 Challis (named for an Idaho town), kept everyone entertained all day long, except when she was napping or being bottle fed. 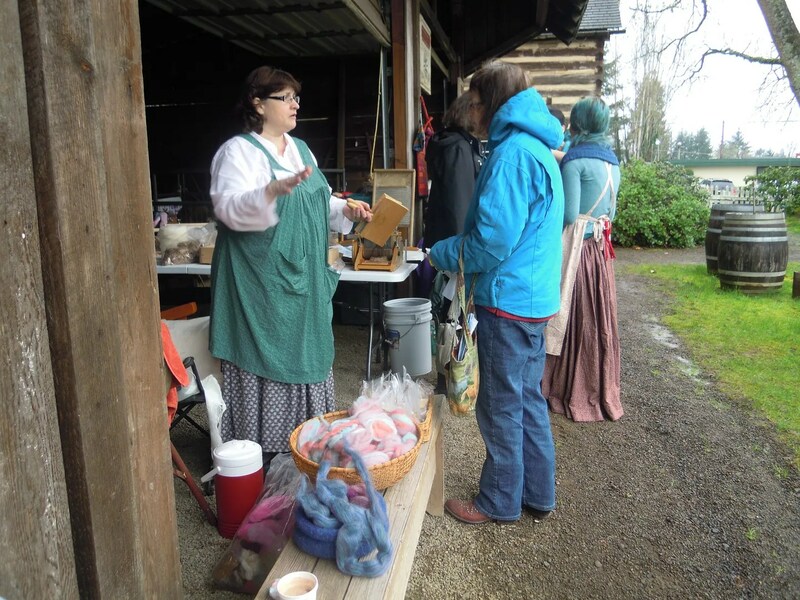 Carol was in charge of the sheep to shawl demo, showing people how wool goes from sheep to carding to wheel to knitting. 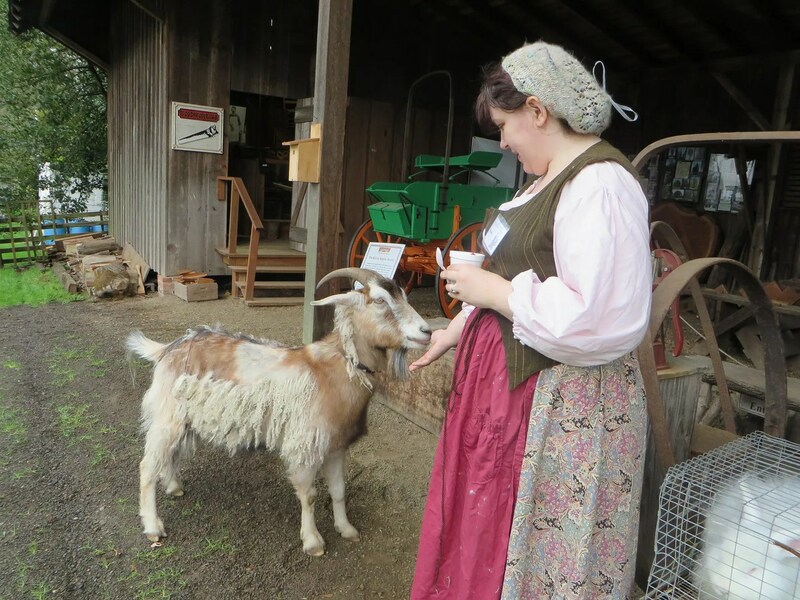 Challis roamed around, captivating everyone. 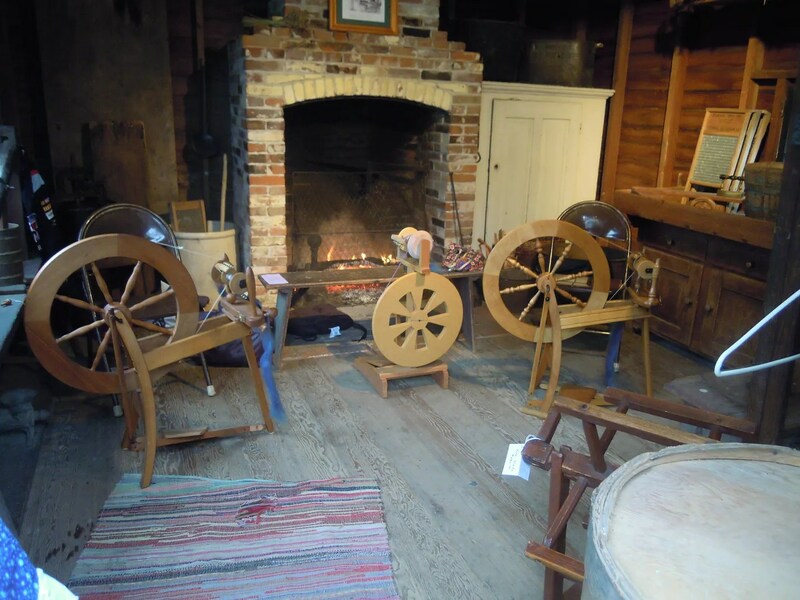 These are the spinning wheels in the washroom, all set up for people to try their hands at spinning. 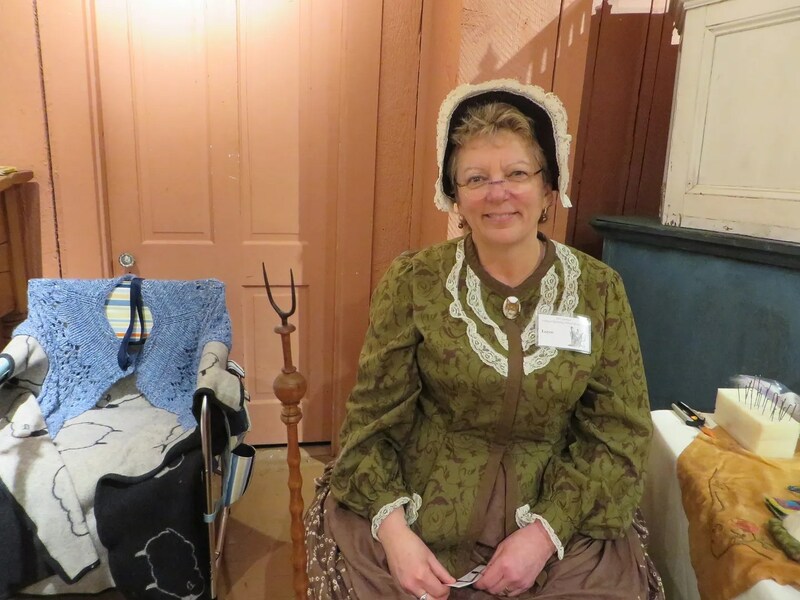 This is the real washroom that was used when the museum was a real farm. 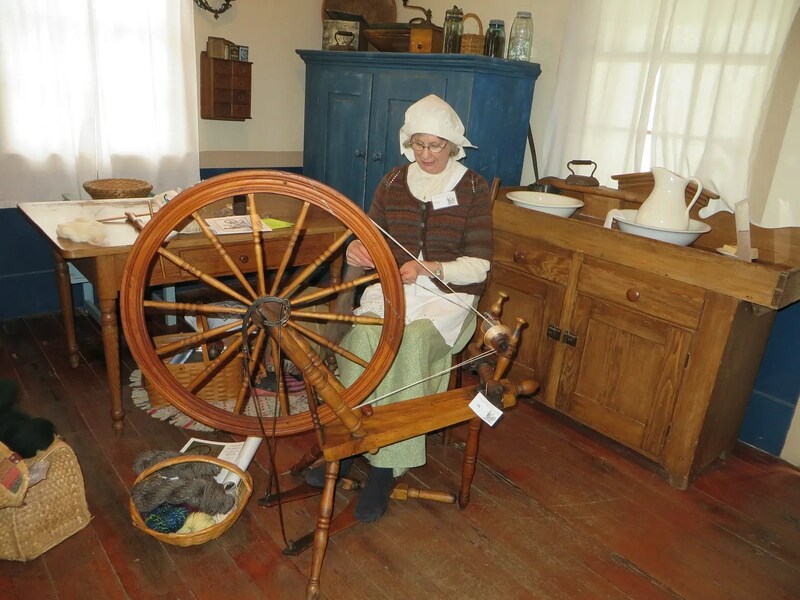 This is called a super-slanty wheel; notice how the front legs come directly out of the table and its large drive wheel. 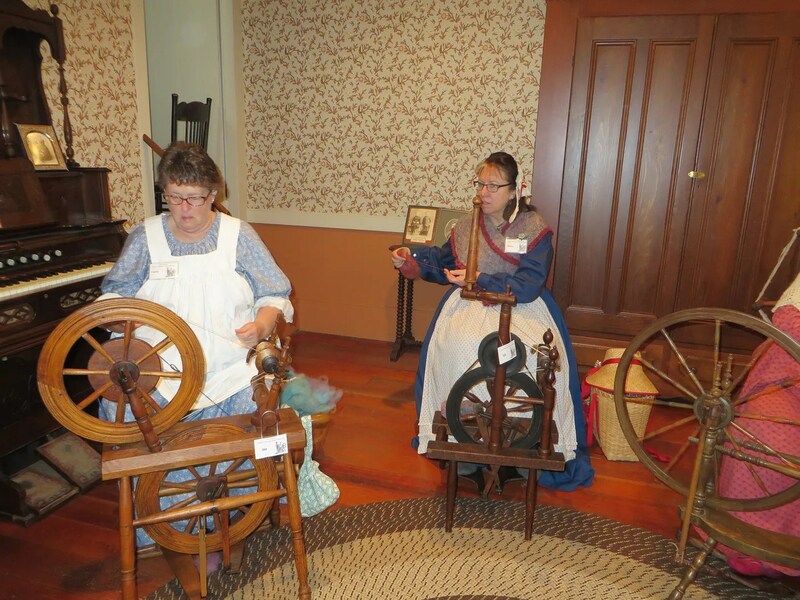 Challis was taking a nap, so Susie, her owner, got to spin for awhile. These two ladies were just around the corner from where I was spinning. Heidi, on the right, is from Germany, and so is her wheel. 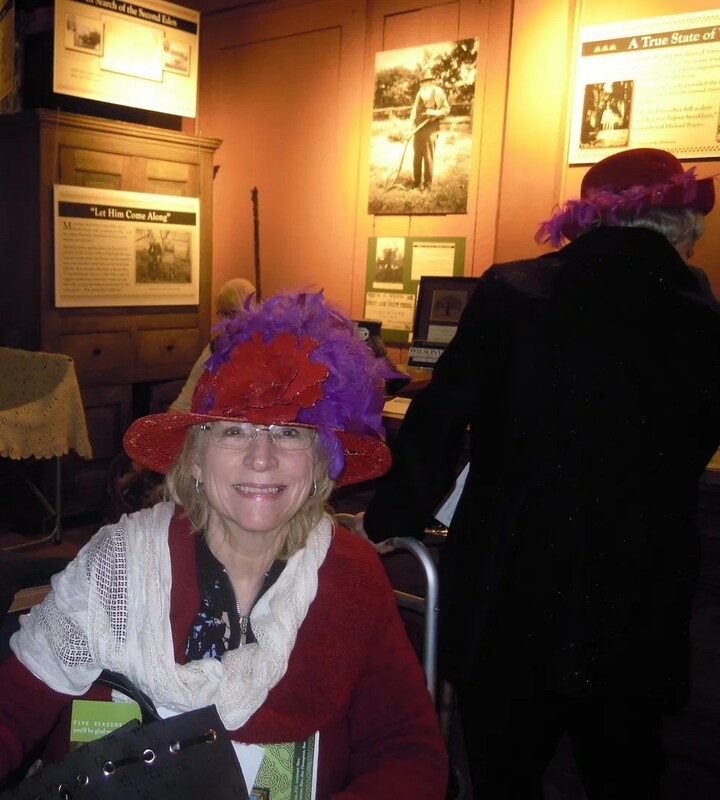 We got a real treat when a group of women from the Red Hat Society came through. 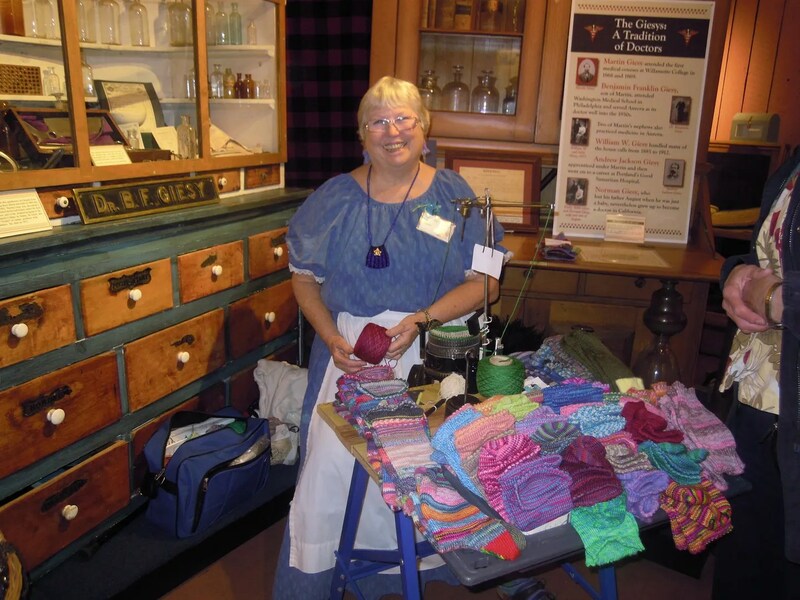 This lady was demonstrating how to knit socks using an antique sock knitting machine! 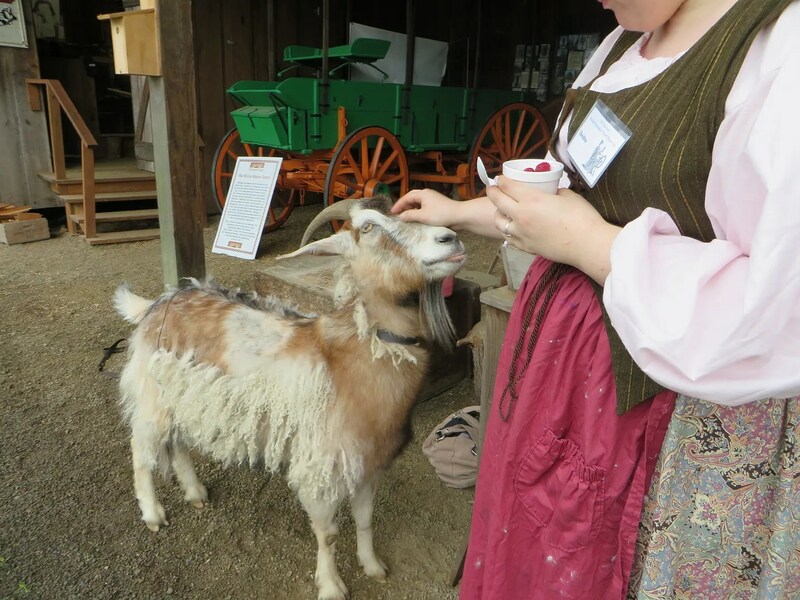 On Sunday, Jack the goat came to visit. He was a real sweetie. His owner got him for free from Craigslist. And some bunnies came to visit, too. 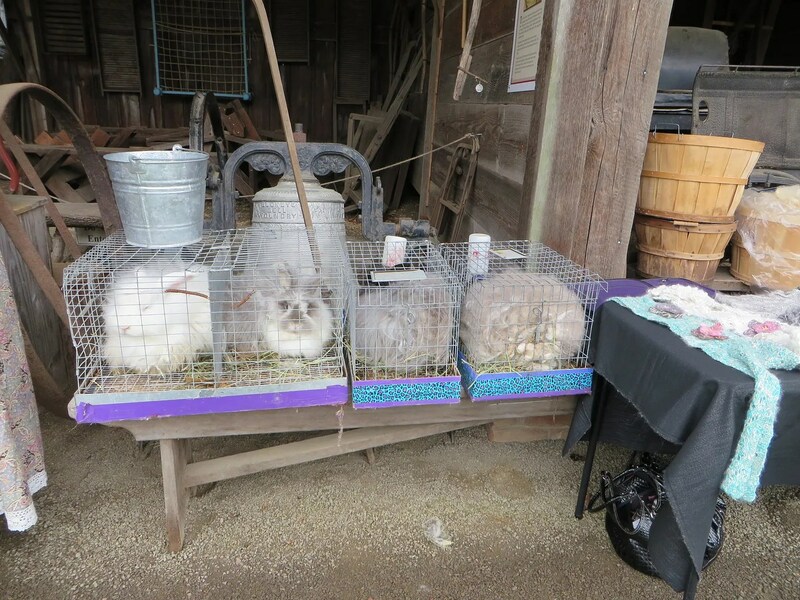 They’re Angora bunnies, and their fur makes lovely yarn. Notice the two drive wheels on the wheel on the left. See what I mean about how every single wheel is different? No two alike. This wheel’s name is George. 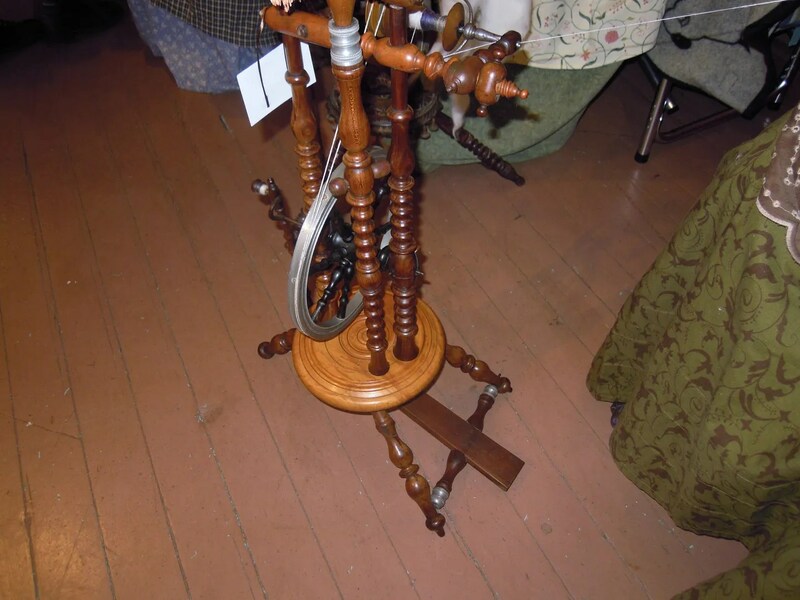 He’s very unique in that he’s a double treadle wheel, which is very unusual in antique wheels. Here’s a video of George in action. 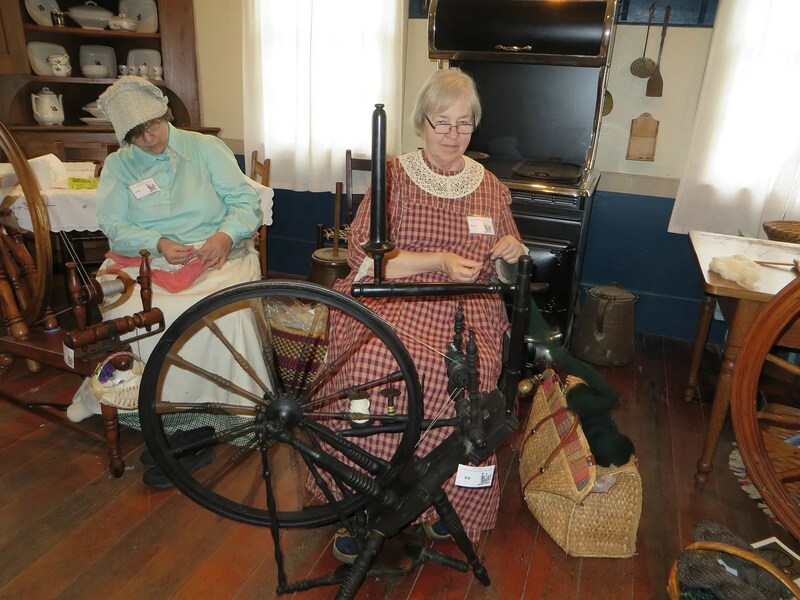 Notice the double treadles, the wire footman, and the way the two cranks work together. What a treasure! Wheel trouble and one spinner helping another. 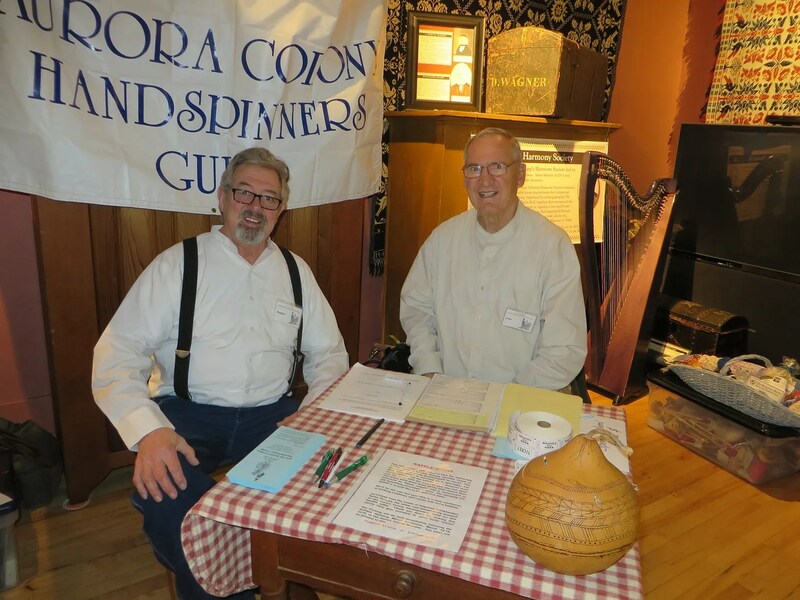 On Sunday morning, we had lovely harp music in our area. It was absolutely wonderful! 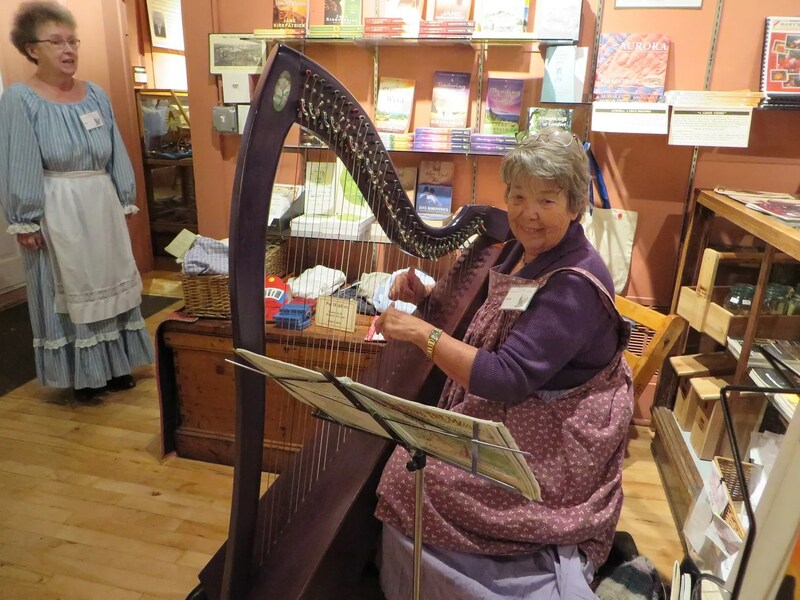 In the afternoon, the harpist moved over to Kraus House so that they would have music there. Challis came into the kitchen at lunchtime on Saturday. 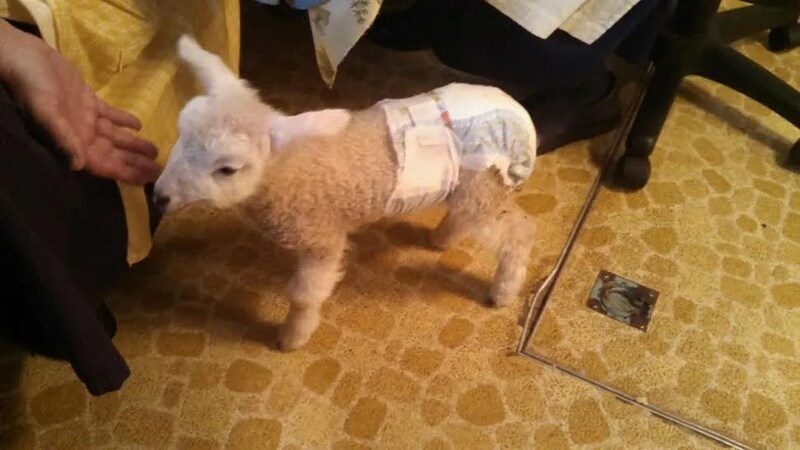 She’s wearing a disposable diaper. ROFL!! 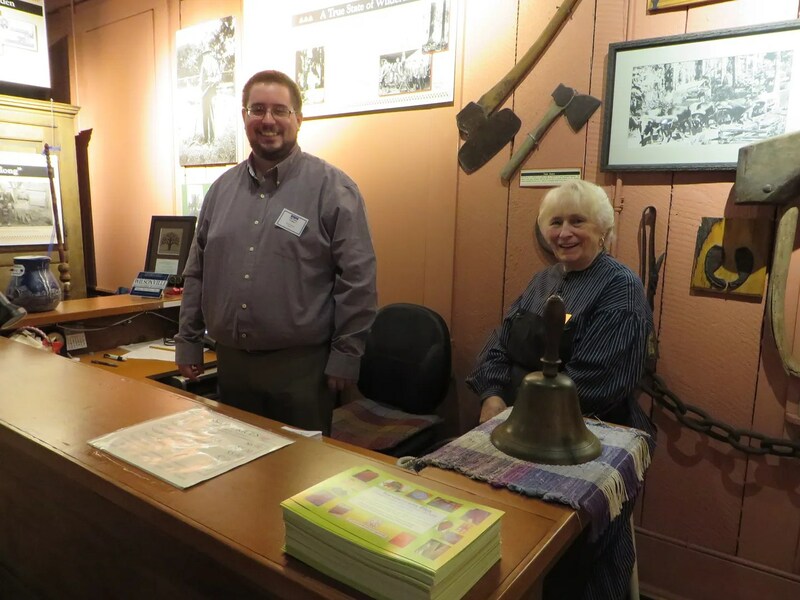 Museum volunteers helping people up at the front desk. 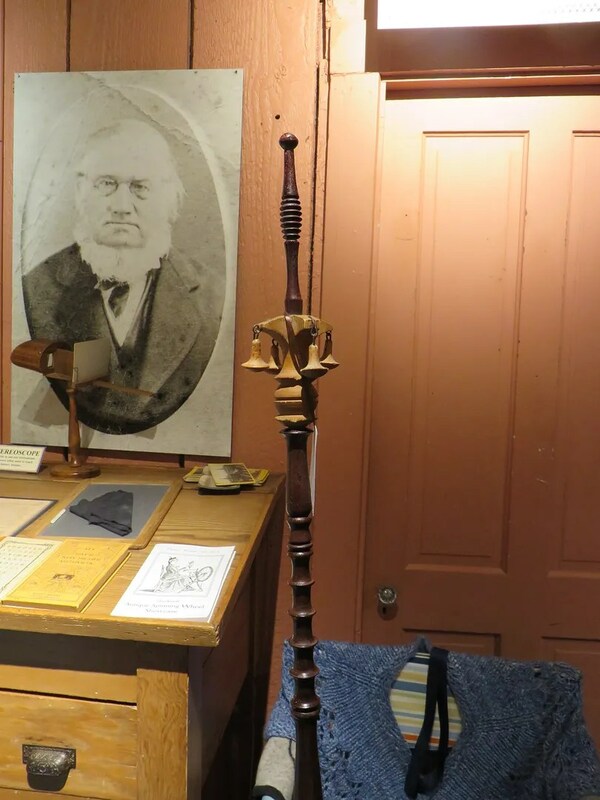 That’s a wicked-looking distaff on the wheel! And try look this one! 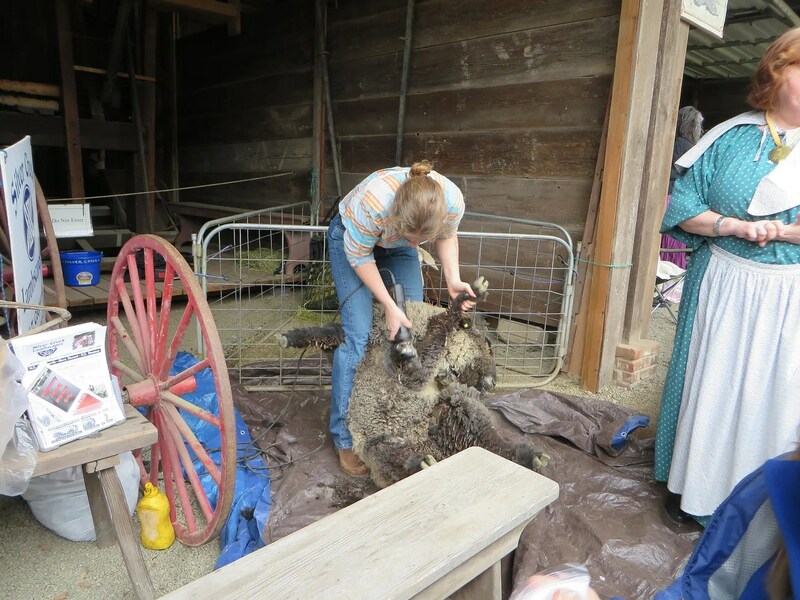 There was more sheep shearing on Sunday. 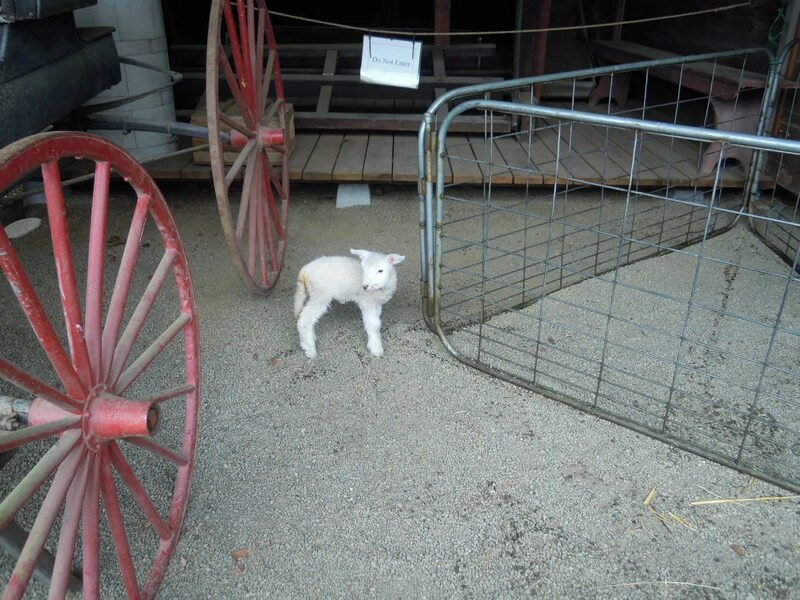 Sunday, a white ewe got shorn. 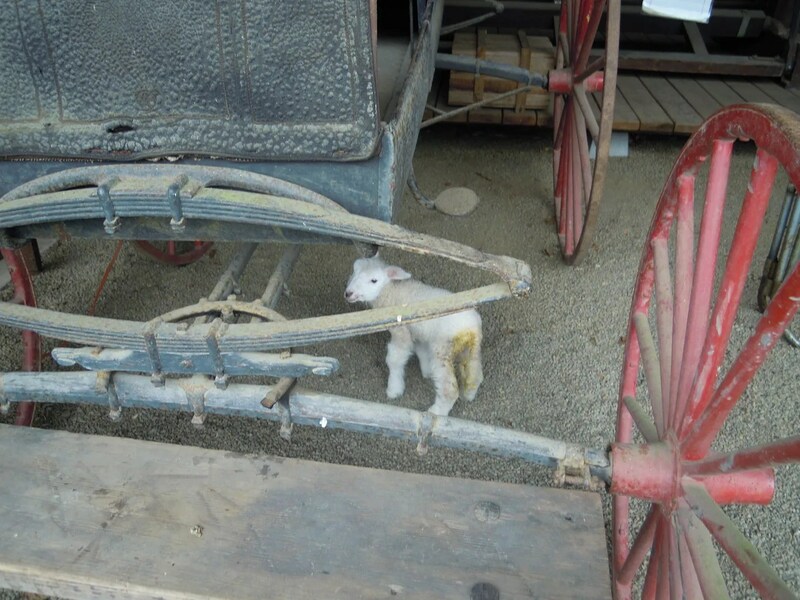 And here’s a sheep shearing video for you folks. 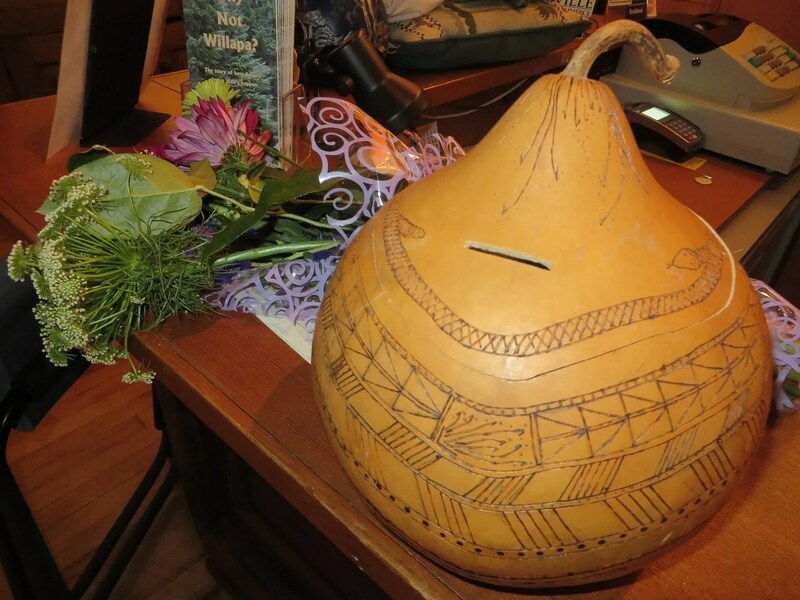 This is the gourd that held the raffle tickets. 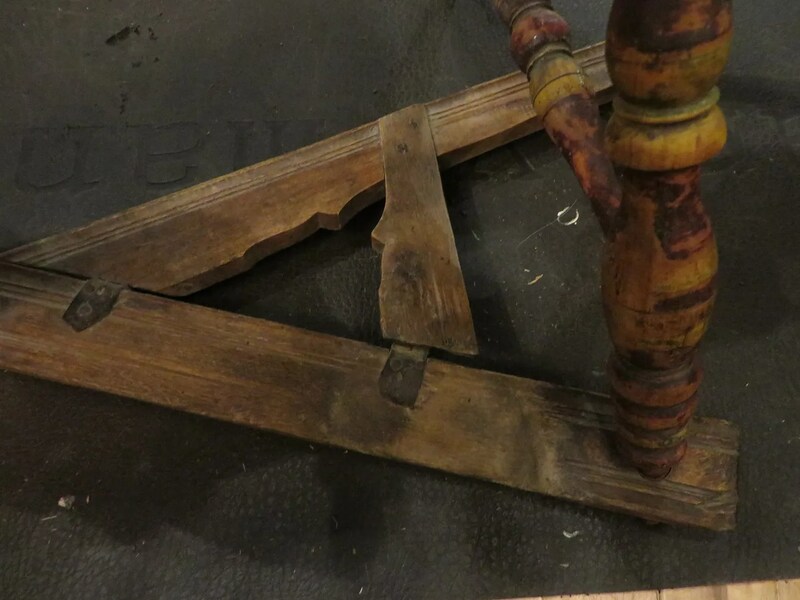 This is the raffle wheel I was spinning on; if you look closely, you can see the imprint on the treadle of years of many feet spinning on it. Exquisite painting on the wheel. 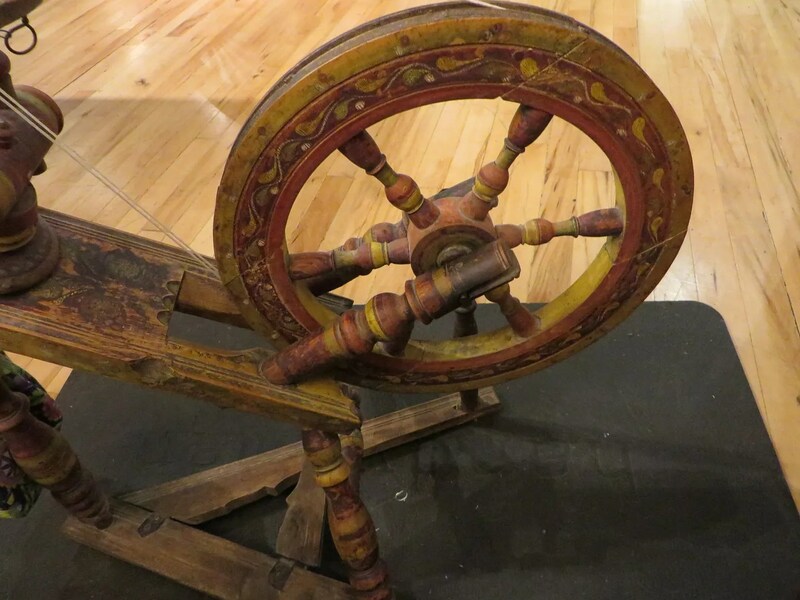 And yes, this is me, spinning on the painted wheel. I leave you with this quote from a Ravelry friend, Aelie. 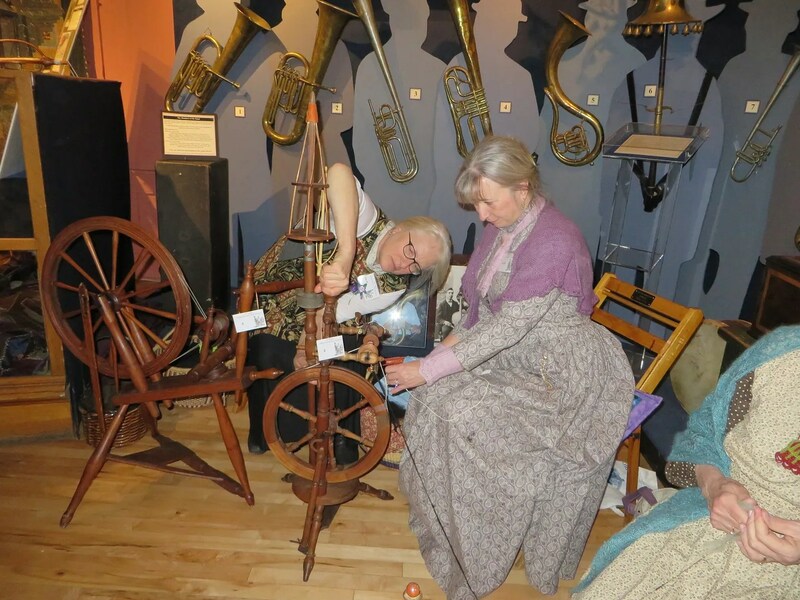 She is an historian and her words speak beautifully about the heart and soul of why we spinners do what we do. I think having the wear on the wheel is actually good — it connects you to the past AND to the future by reminding you that you are just the temporary guardian of one of these wheels. 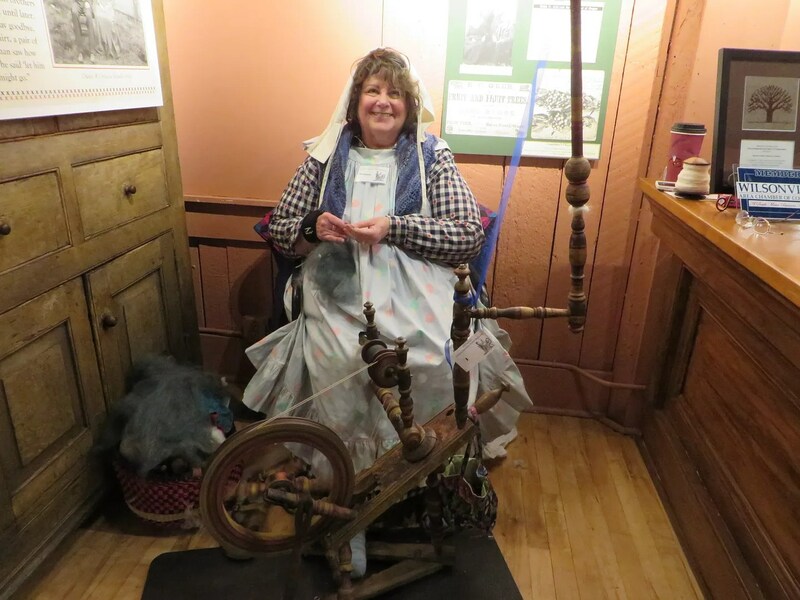 This entry was posted in Handspinning and tagged antique-spinning-wheel-showcase, aurora, handspinning. Bookmark the permalink. Oh, Moki-chan, this post made me all waimaka. I love that you are carrying on this tradition with wheels that were used before you and will be used after you. I know that your mana and good mana`o will infuse your wheel(s) and bless whoever uses them afterward. And it’s good to see your smiling face in that photo. On a more prosaic note, *now* I understand the old Sleeping Beauty fairy tale in which she pricked her finger on the spinning wheel and fell into a deep sleep. 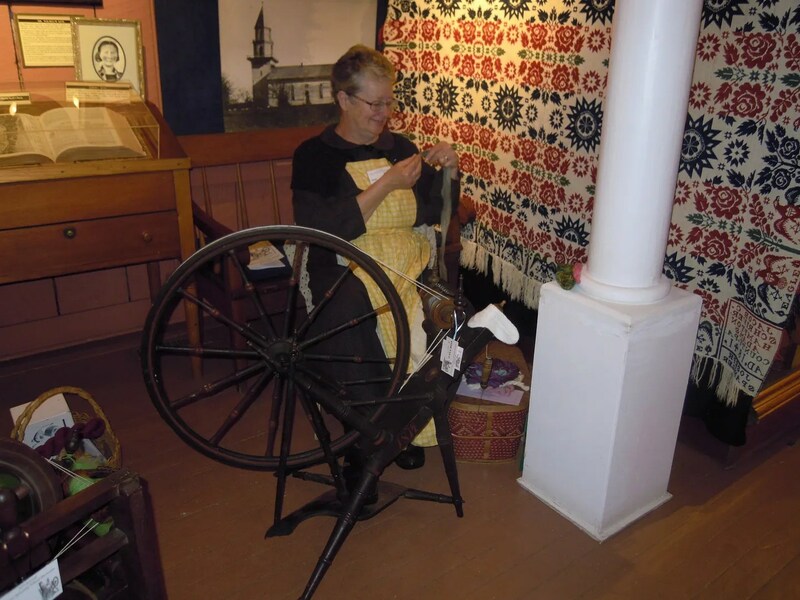 No doubt at one time everyone knew what a spinning wheel looked like and so understood the story–not so today. Your comment makes me all waimaka too, because you get it! You understand the history and the sense of continuity and carrying on tradition. You understand the spiritual connection with the past, and I am so grateful for that! 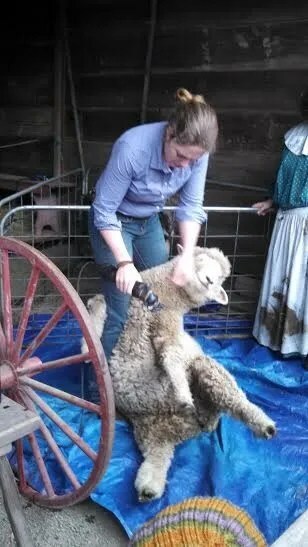 Spinning , a lamb, and a harp- I am jealous and sitting in the Boston airport waiting to meet my son-wishing I could have gotten on a plane to go to your event. Your great pictures helped me to live vicariously .